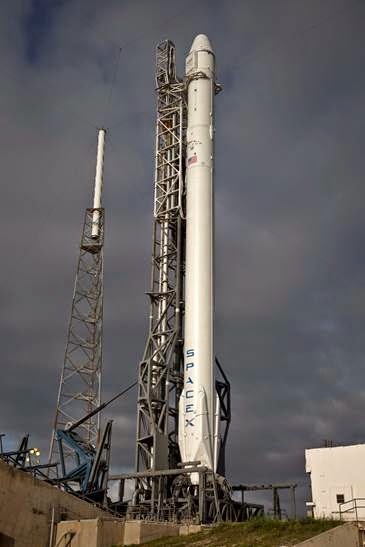 CAPE CANAVERAL, Florida -- NASA, along with its International Space Station partners, and SpaceX have scheduled the Falcon 9 launch from Space Launch Complex 40 at Cape Canaveral Air Force Station in Florida for Friday, April 18, 2014 at 3:25 p.m. EDT. This SpaceX-3 mission will deliver a Dragon capsule to the International Space Station carrying about 4,600 pounds of science and research, crew supplies, vehicle hardware and spacewalk tools to support the ISS crew and more than 150 scientific investigations planned for ISS Expeditions 39 and 40. The most recent forecast issued by the U.S. Air Force 45th Weather Squadron predicts only a 40% chance of overall permissible weather conditions for the SpaceX Falcon 9 Friday launch. The primary weather concerns for launch are lightning, thick clouds, and precipitation. If the Falcon 9 launch is scrubbed on Friday, SpaceX will attempt another launch on Saturday, April 19, at 3:02 p.m. where weather chances improve to a 60% chance of overall permissible conditions for launch. Once in orbit, the Dragon capsule will rendezvous with the space station where it will be grappled and berthed to the complex for an expected four-week visit.